Ranchlands values feeling safe walking around the community and near streets, having beautiful parks and more gardens, having residents who care about their properties, and having modern playgrounds where families can gather. Residents outlined what was important to them, focusing on the themes of people, places, programs and possibilities. The City then worked with residents to identify projects that would support the vision and be possible in their neighbourhood. Residents prioritized the projects and City Administration ensured they could be implemented. Through these projects, residents in Ranchlands will feel proud of their beautiful community. New signs along the pathways will enhance the community’s identity, increase walkability, and help neighbours explore new areas of the community. Projects will also enhance green spaces in the neighbourhood. The following is a summary of programs, services and/or small-scale infrastructure improvements that The City of Calgary will implement in partnership with residents of Ranchlands. Please note: Public Art projects are on hold until a corporate direction is confirmed. Below is a list of projects that residents mentioned to us, some are currently underway and fit within your neighbourhood vision some are not possible for The City to do as part of this program and we want to tell you why. A safer crossing at Ranchlands Boulevard & Ranchero Drive: City of Calgary Roads has installed a ‘Rectangular Rapid Flashing Beacon’ at that intersection. More opportunities to engage with each other and connect: The City along with the Ranchlands Community Association and other community partners are working together to make this a focus for the upcoming year. Pathways in the community repaired or replaced: For current and future pathway (capital & operational) work please visit the Pathway Map in the City’s map gallery on https://maps.calgary.ca/PathwaysandBikeways/ This mapping system shows people with real time updates on capital and operational work on our pathways. Thank you to everyone who participated and shared ideas with us, the public engagement is now closed. The initiatives will begin implementation in 2018. A full summary report of everything we heard during the engagement can be found here. For What We Heard reports for each of the engagement phases see below. A report of what we heard when Ranchlands residents prioritized initiatives created at the idea workshops to make their vision a reality is available here. The report of what we heard during the Ranchlands workshops is available here. The vision statement for Ranchlands is: Ranchlands values feeling safe, walking around the community and near streets, having beautiful parks and more gardens, having residents who care about their properties, and having modern playgrounds where families can gather. Thanks to everyone who provided input into the neighbourhood vision words. All the ideas you provided can be found in the What We Heard Report. Input is now closed. Below are the questions we asked in November-December. The report of what we heard is available here. Below you will see the 6 initiatives for Ranchlands. Each initiative has one question (a) to help us understand what you feel the impact of each initiative would be on the community. Then there are questions (b, c) about the same initiative asking about the details that City staff need to know if that initiative goes forward. City staff and community volunteers would focus on John Laurie Boulevard to provide Tender Loving Care (TLC) to the area. This can include garbage clean up, painting, graffiti removal, minor infrastructure repairs, grounds keeping and more. The cleanup and beautification of this space would enhance the area and increase community pride. 1b) If this initiative were to go forward, what would be your top two preferred options for TLC Day on John Laurie Boulevard? An Open Space Assessment is how The City plans for the future of the open, green spaces in a community. The City will work with the community to develop a long-term plan for the future use of the neighbourhood’s existing green spaces. Beautifying the tunnel or surrounding area with art and/or events to increase walkability in the area and community pride. Three of Ranchlands' parks have the special designation as a "Cultural Landscape." Adding signs that describe their value and importance in the neighbourhood and in the city, will help to enhance community identity, increase residents’ knowledge of neighbourhood, contribute to walkability, and assist residents in exploring and discovering new areas of their neighbourhood. Unique activities and park exploration event in Ranchlands. Will bring community members together and help people get to know each other, be active and create community pride. Will also make good use of the green space. Public art project along the border fence of the community association property with resident participation. Public art contributes to the beautification of the neighbourhood. Residents enjoy their public spaces more, and feel a greater sense of community pride and connection when they view the artwork they influenced. From July 28 to August 8 we asked for your preference on the vision statements. See below for results. Pick the vision statement you think is best for Ranchlands. Ranchlands values being Safe, Beautiful, Clean and Family-Friendly for their neighbourhood. Ranchlands values feeling safe walking around the community, having beautiful parks spaces and clean properties, and modern playgrounds for their neighbourhood. Ranchlands values feeling safe walking around the community and near streets, having beautiful parks and more gardens, having residents who care about their properties, and having modern playgrounds where families can gather for their neighbourhood. The City created This is my neighbourhood to work with residents to create a community visions that helps guide the delivery of City programs, services and small-scale infrastructure improvements. This is my neighbourhood began in 2015 with a group of 14 inaugural communities. As part of the This is my neighbourhood program, The City partnered with the first group of neighbourhoods to deliver more than 100 programs, services and small-scale improvement projects that residents requested. Overall, This is my neighbourhood will take place in 28 neighbourhoods over four years from 2015 to 2018. The initiatives will begin implementation in 2018. Coming up with creative ideas (programs, services and small-scale infrastructure improvements) that support your vision. 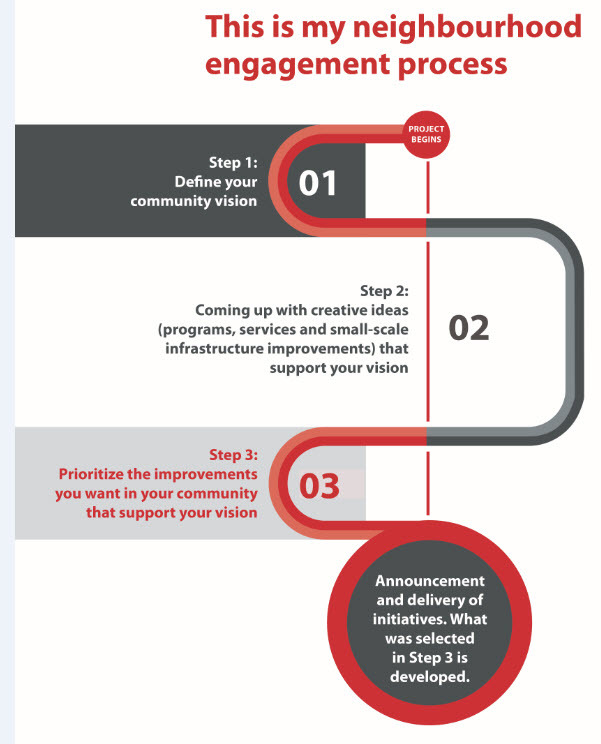 Prioritize the improvements you want in your community that support your vision. Announcement and delivery of initiatives! What you selected in Step 3 is developed. You can also visit the Ranchlands Community Association website at www.ranchlandscommunity.com.